Mumbai, May 19 (IANS) Anupam Kher has agreed to feature in Shahid Kapoor starrer "Mausam" and says the fact that his good friend Pankaj Kapoor is directing the film was a good enough reason for him to give his nod for the project. "I'm yet to get a clear indication of my role. But the fact that Pankaj is directing is enough incentive for me," said Anupam, 55, who will join the "Mausam" team in Edinburgh, Britain. "I'm very fond of him (Pankaj) as an actor and as a human being. And I also like his son Shahid a lot. 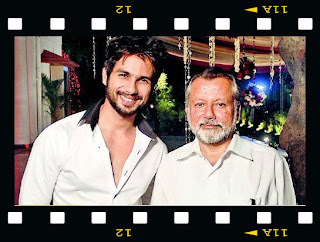 In fact, in his brief career I've played Shahid's father thrice (in 'Vivah', 'Dil Bole Hadippa' and 'Badmaash Company')." This time, though, Anupam isn't playing Shahid's father. It is apparently the role that Pankaj had earmarked for himself. Now with direction proving a full-time occupation, Pankaj would rather concentrate on direction and let others do the acting. However, the dates for "Mausam" are still being worked out. Meanwhile, Anupam flies out to the Lake District in England for a walk-on talkathon on the BBC's prestigious business talk show "Peschardt's People". The internationally known host Michael Peschardt is known for grilling entertainers, academician and others on his show. From India, N. Narayana Murthy, Vijay Mallya and Amitabh Bachchan have appeared on his show. "I like representing our country on international platforms. Specially on a non-film platform. I think I've moved ahead of being just an actor," Anupam said.